In a wave of nostalgia that has suddenly overtaken me in the last half hour or so, I decided to go and dig up some things I remember fondly. Like Rohrs'. I am of the firm belief that everyone who claims to write should at some point in their lives work in a non-chain coffee shop. This belief is becoming more and more difficult for other people to execute because of the Starbucks-on-every-corner, or, in the case of New England, the Dunkin-Donuts-on-every-corner syndrome. However, I filled my requirement back in high school. I call it a requirement for two reasons - 1) because you meet tons of interesting people, and you can pick their brains and steal their quirks for future characters, and 2) because every writer should have a very healthy relationship with caffeine. 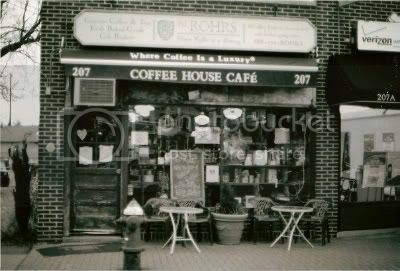 Rohrs' closed about two years ago for good, although there is still a location or two in Manhattan. This picture makes me think of it as fondly as I think of Clerks; and being from Jersey, the love/hate relationship with my job was a strong one even before I knew who Kevin Smith was. There were plenty of days when I wasn't even supposed to come in, but I usually came in anyway. Cos it meant a five hour shift with free coffee and company that was note-worthy, if nothing else. I miss the Millenium French roast so badly. I could conceivably order it online, but I miss grinding the beans myself.